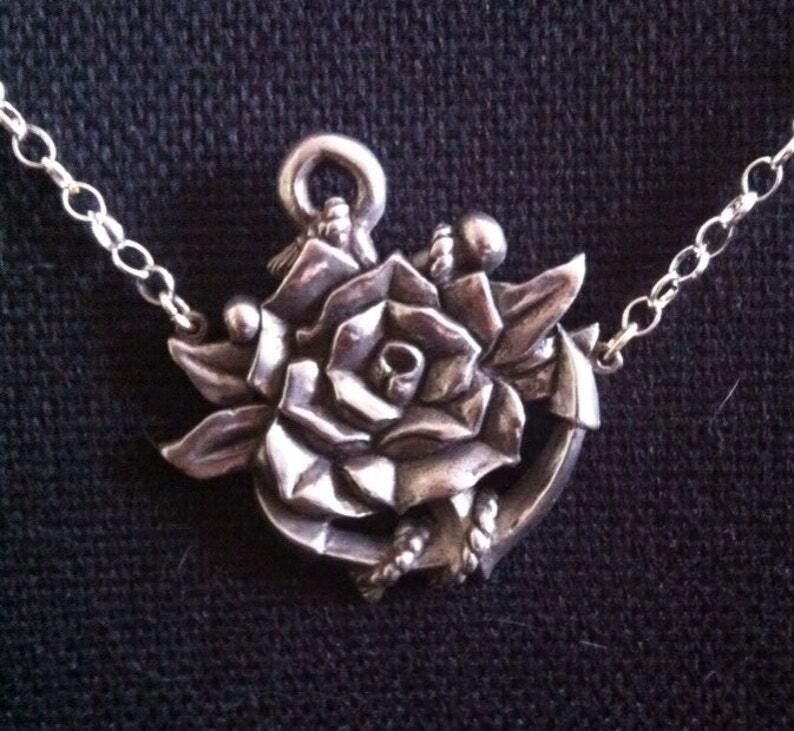 This Rose and Anchor Necklace is the ultimare statement piece! This pendant has beautifully crisp sculptural detail and comes on a heavy duty silver plated belcher chain and has a toggle clasp (t-bar) fastening. All my jewellery is made from Fine English Pewter, with silver-plated findings. All the designs are unique, I make the master sculpts, the molds and do my own casting, you won't find any of these anywhere else! Jewellery is lead, nickel and zinc free. Rose and Anchor Necklace COLOUR!!! Sweet Cherry Tattoo Necklace COLOURED! Meraviglioso, un gioiello Divino. spedizione velocissima, eccellente venditore. Déçue. Ça devait être le cadeau de noël de mon conjoint. En me renseignant pour l’achat , aucun soucis réponses rapides vendeur agréable. Ensuite plus de nouvelles pendant 3 semaines. Un message rapide me disant expédié et que je recevrais un numéro de suivi. Jamais eu de nouvelles depuis. Vendeur pas sérieux du tout. A éviter. Currently we accept Paypal ONLY as a method of payment. Please be aware when you place an order that all my items are not only hand-made, but MADE TO ORDER. This means I have to take effort to create your order, and as such, I cannot offer refunds on unwanted purchases, ALL SALES ARE FINAL! This means that any purchases you made cannot be cancelled, I only offer an exchange on faulty items. Because I make all of these pieces myself, from the initial design stage, all the way to the casting and the finishing, I have a very high standard of quality control. If it does happen the piece you have purchased is faulty, please contact me within 7 days of receiving the item, and I'll endeavour to make a replacement item for you. You will be required to send back the faulty item to me (at your own cost), upon receipt I'll send out the replacement (at my cost) to you. Hopefully this will never happen, but please feel confident that IF you do recieve a faulty item I'll do my utmost best to rectify the situation. Unfortunately due to the fact Etsy only accepts postage methods with delivery confirmation as a valid form of postage when an item might go missing, I'm unable to offer international postage without Airsure, which is a form of registered mail. I am not able to send items to countries that the Royal Mail does not currently offer airsure for, so if you wish to order anything, and the item is not being sent to the following countries please contact me for alternative postage options. * Airsure® to European Union destinations is subject to VAT at the standard rate. The reason for this is because I have recently had an item "gone missing" in the USA. I then sent out a replacement which had also "gone missing". The customer that bought the item then opened up a dispute and had his money refunded, and I was charged another £14 by Etsy for Chargeback fees. All of this happened because "normal" international signed for does not provide tracking internationally, and Etsy did not recognise it as valid proof the items had been sent. Frustrating, i lost over £70 in postage costs, the sales costs of the items and fees, which is frustrating because I use my Etsy money to buy my materials for my craft projects and can now not buy any untill next month. I hope you understand, thank you. I get asked a lot if I'm available for doing one-off commission work. Yes I am, but I'd like to explain a few things about the process here. Sculpting and making the mold of any of my pieces takes time, it can be as little as 6 hours, or as much as 40, depending on the item and the size of the item. Making the mold can take as long as 1 or 2 days, again, depending on the item. The costs of the sculpting material, mold rubber and casting material are added to the total initial cost of the item. So, with that in mind the quote will consist of my hourly rate times the hours worked on the master&mold plus the costs of the materials. Why are you charging so much for my one-off item when similar pieces in your shop are priced at a fraction of the price? The answer is simple. I produce my pieces in runs, some as little as 50, others as large as 200. The initial costs of creating the pieces is spread out over all the pieces of the run, lowering the cost of each piece significantly - which in turn affects the retail price. If you request a one-off unique piece it will incur all the initial costs mentioned above into the one item, so will naturally be more expensive than a piece produced in a run. I am not VAT registered because I am not currently required to do so. This may change in the future, depending on the growth of the company. I do take commission orders from bands and organisations who are in need of small runs of merchandise such as badges or jewellery, depending on my availability to do so. 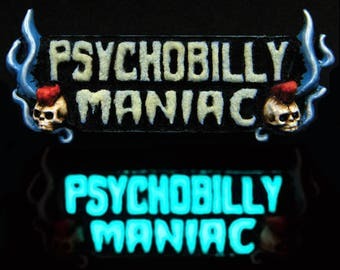 I currently do not make belt buckles because I lack a vital piece of equipment to do so. I am hoping to be able to invest in said equipment in 2014. 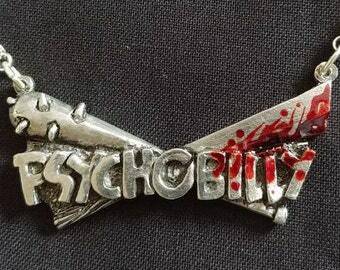 Buzz saw Psycho Pendant SPECIAL OFFER!